Universal Avionics and MD Helicopters, Inc. (MDHI) are dedicated to delivering high-performance products that exceed customers’ expectations for quality, service and support. The Next Generation flight deck for the MD Explorer is no exception; the two companies have partnered to bring the most advanced technology into the flight deck of the world-renown and redesigned light-twin helicopter preferred by law enforcement, air-rescue and emergency medical services organizations around the globe. The program is well underway with many significant progress updates. 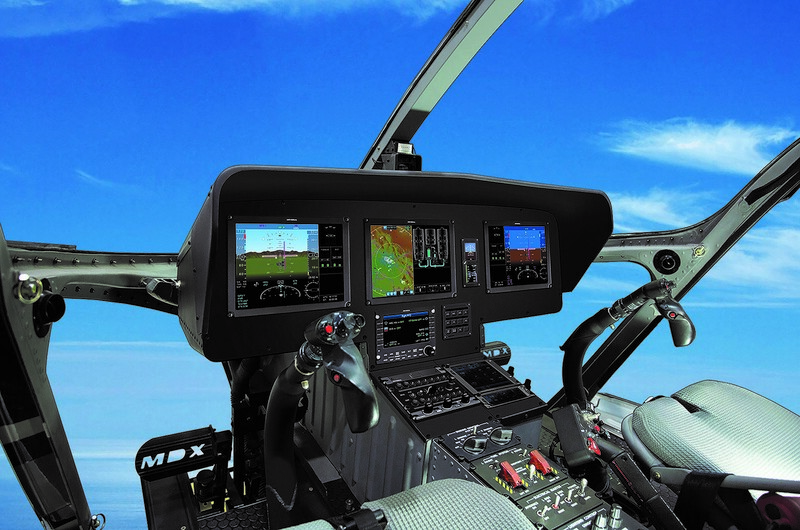 “The Universal Avionics Next Generation flight deck development for the MD Explorer helicopter is advancing as expected,” said Grady Dees, Universal Avionics’ Director of Technical Sales. “Universal Avionics is currently working on finalizing specifications for Engine and CAS development as well as design and construction on the systems integration test rig that will be used for both integrated testing and for demonstration / Human Factors evaluations,” he added. At the MDHI Mesa facility, final vendor selections for all peripheral avionics systems have been completed and documentation for installation and approval, as well as preliminary systems safety assessments, are in work. System requirements reviews are also ongoing. Of particular note, the engineering prototype helicopter that will be the conforming article for FAA ground and flight test is undergoing a major overhaul / rework to meet the latest designs and standards. The Next Generation single-pilot IFR-capable flight deck is available through MDHI for production and retrofit of any MD Explorer helicopter. It is designed to ensure the MD Explorer maintains its position as the most capable, cost-effective and versatile light-twin helicopter available. Specifically tailored for the low altitude operations of rotorcraft, the new flight deck features large format high-resolution LCD displays with LED backlighting. A collective-mounted Cursor Slew Switch allows for a unique “point and click” display control allowing pilots to keep “hands on, head up” during all phases of flight for unprecedented situational awareness. A functional and interactive demonstration of the flight deck is available during the Helitech International Helicopter Expo and Conference at Universal Avionics Stand A40 while exhibit halls are open Tuesday, October 14th – Thursday, October 16th. To learn more about the Next Generation flight deck for the MD Explorer, stop by the Universal Avionics Stand or MDHI Stand E20 at Helitech International, Amsterdam, Netherlands. Representatives from both companies will be on hand to speak directly to customers interested in the program. More information can also be found at: www.uasc.com/md.